Male, 21 to 40 years old; Must possess at least a high school diploma; With relevant TESDA NC II training certificate is a plus; With at least 1 year experience in similar/related job is an advantage; Has good verbal communication skills; Must be willing to render overtime work even on Sundays/holidays; Can handle work pressures. Female, not more than 26 years old; At least 5’4” in height; With pleasing personality; Graduate of any 4-year courses or its equivalent experience; With at least 6 months of solid experience as Food Attendant in hotel industry; Has good communication skills; Must be dynamic, smart, adaptive, responsible and trustworthy. Female, not more than 24 years old; Graduate of BS in Accountancy or other relevant courses; With at least 1 year experience in similar/related field; Must be smart, adaptive, industrious, honest and responsible; Must be willing to work on extended hours. Male, 25 to 30 years old; With relevant TESDA training certificate; With at least 2 years of experience in similar job; Must be knowledgeable of basic electrical and air conditioning system; Must be hardworking and trustworthy; Must be willing to render overtime work. Male/Female, 18 to 25 years old; With pleasing personality; With or without experience; Must be willing to undergo training; Must be honest, smart, hardworking and a fast learner; Can work under limited supervision. Candidate must possess at least a high school diploma; With at least 1 year experience in similar job; Must be very patient, reliable and honest. Female, 18 to 25 years old; At least 5’2” in height; With pleasing personality; At least high school graduate; With experience as Food Server/Cashier in a restaurant is an advantage; Has good communication skills; Must be customer service-oriented; Must be willing to work on shifting schedule. Candidate must be at least college level; With 2 to 5 years of cooking experience; Must be very familiar with Korean cuisine. Candidate must be at least college level; With at least 6 months to 1 year of relevant experience; Must be familiar with Korean cuisine. Male/Female, 20 to 30 years old; Must be a graduate of BS in Mechanical or Chemical Engineering; With or without experience; Has competent computer skills, including proficient use of MS Word, Excel and Powerpoint; Has excellent analytical and verbal & written communication skills; Must have the ability to gather and interpret complex data and resolve uncommon problems; Must be goal-oriented and with initiative. Male/Female, 20 to 30 years old; Must be a graduate of BS in Accountancy; With or without experience; Has excellent analytical skills; Has competent skills in MS Office programs. 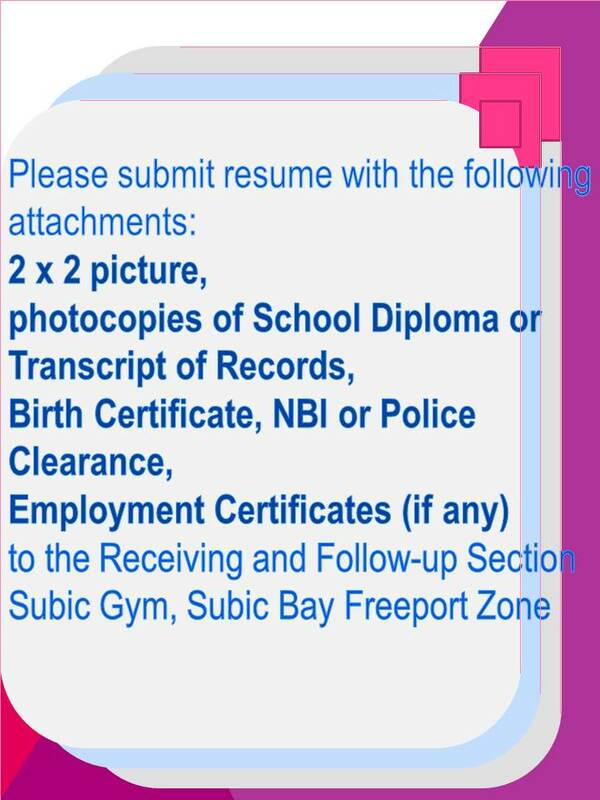 THE SUBIC BAY YACHT CLUB, INC.
Male/Female, 21 to 26 years old; At least 5’5” in height for male and 5’4” for female; With pleasing personality; Must be college graduate, preferably of relevant business courses; With experience as Front Office Associate/Receptionist is an advantage; Must be trustworthy and of good moral character; Can work under pressure and with limited supervision. Male/Female, not more than 30 years old; Must be college graduate, preferably of relevant business courses; With experience in banquet events is an advantage; Must be trustworthy and of good moral character. Male, 21 to 35 years old; Must possess at least a high school diploma; With relevant experience is an advantage; With knowledge in masonry, carpentry and painting. R. JOSEPH HOLDINGS SUBIC, INC. Female; Must be college graduate; With pleasing personality; With knowledge of wines and liquors is an advantage; Has excellent communication, negotiation and customer service skills.